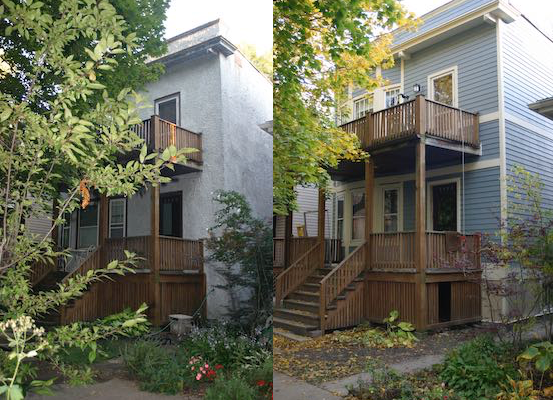 Our house, before and after we got new siding in 2011. I live on the top floor of a two-flat on a leafy street, just a few doors from Western Avenue, one of Chicago’s main drags. Chicago’s Elevated train runs behind the houses across the street from me, and Western Avenue has an L train stop, so in the summer when our windows are open, we can hear the electronic “bing-bong” of the train as the driver warns riders to get on before the doors close. Covered in stucco when we bought it thirteen years ago, we switched it to blue clapboards with grey trim eight years ago, after some of the stucco slid off the house. The new color is still sharp, and makes our house standout on the block, I think. We still have the original, grungy front porch though, which provides plenty of space for sitting on both the first and second floors. In summer nights, my wife, Teresa, and I like to sit on the upstairs front porch, feel the breeze and listen to couples talking as they walk beneath us. Most of the houses on our block are two or three-flats, occupied by renters. We’re one of the few owner-occupied homes, so my wife and I haven’t gotten to know many of our neighbors. But the Bakers live right next door, and their two kids are about my son, Nicolas’, age, so in warmer months, they play outside or run back and forth between each other’s houses. So much of our lives are centered on our neighborhood within a few square blocks. Nicolas’ public school is just two blocks away. Only in fourth grade, he walks to school on his own every day. A nearby park hosts Nicolas’ little league baseball. I swim laps in the fieldhouse there three times a week. Teresa attends a weekly art class a couple blocks away, across the street from a first-run movie theater. Every month I go to a book club with some neighborhood dads in a bar just down the street. And perhaps my favorite feature, I can walk to my neighborhood grocery store, where the owner every year sells me a trussed up pig for my birthday pig roast. It’s idyllic and hard to believe that we live in a big city with these kinds of amenities. When we were engaged, we talked a lot about where we would settle down and chose the city more for ideological reasons than anything else, I think. We believed the city was where humanity was trying hardest to solve societal problems, and where we would most likely be challenged by people and cultures unlooked for. While we get some of that where we live, I more often just find myself ambling from place to place, getting to know the various shopkeepers and characters of the neighborhood. We’ve woven ourselves into the community, by coaching little league, volunteering for our local public school, making local friend groups. Truthfully, we stumbled into our situation. Teresa and I started looking for a house to move into almost as soon as we got back from our honeymoon. It was a long and arduous process, since we had a specific price target and a long list of demands: To be in the city, near a rail line, a big park and with a backyard and parking. For months our Saturdays and Sundays were consumed by reviewing listings and visiting homes. I didn’t keep track, but I don’t think it is an exaggeration to say that we walked through forty or fifty homes. Indeed, “the bones” were good, and the neighborhood was exactly what we were looking for. But I was squeamish because it needed so much work, and if we rented out the bottom floor, we’d have barely over 1,000 square feet of living space. We didn’t have kids then, but it was easy to imagine how the house could fill up quickly. “This is the place,” our Realtor said, leaning in to me to make his point clear. “You’re not going to find anything better.” After forty houses, he was probably right. We’ve poured money into our house ever since, and still rent out the bottom floor. We’d love the extra space, but the extra income too hard to give up. Meanwhile our neighborhood’s average income has raced ahead of us as numerous two-flats have been converted to single-family luxury homes. At one point last year, five houses on the block surrounding us were listed for more than $1,000,000. Hard to believe. The rising prices has changed the kind of neighbors we have. When we moved in, it was a smattering of white professionals in a soup of Latino, Italian, Greek and Serbian families, mostly working class, many retired. Before it collapsed, we took down our garage, giving us a clear view of the alley, and people in the alley, a good view of our back yard, where my wife and I are usually found on summer weekends. Frank, an older gentleman with a thick Italian accent and a button-down sweater he’d wear no matter what the weather, would walk up and down the alley on summer afternoons, looking for useful junk people might have thrown away. He lived down and across the alley from us, and after talking with him a bit, we learned that he owned four different houses on the block, acquired through probate court over the years. Looking up, I said, “Yep! That’s it, Frank!” then looked pleadingly at my wife. She made a gagging motion, I think. The old ones have moved on or died. Frank’s junk-stuffed garage no longer houses an illicit wine-making operation, since a nephew or somebody related came by to clean it out one weekend. We haven’t seen Frank in years. He’s probably passed on. I haven’t really gotten to know many of the new neighbors. Most of them either don’t have kids, or their kids are a different age from mine. It’s lazy, I know, but kids are the major way I’ve gotten to know most people in my neighborhood. They’re a natural social lubricant, since kids are able to just walk up to another kid and start playing. The area around my house is full of this kind of kid stuff. Halloween is gangbusters for trick or treaters, kids hang out at the elementary school park nearby, and going to the little league games us adults horn in by hanging out with all kinds of neighbors. Bring a bottle of wine, some chips and a blanket to the game. You’ll have plenty of people to hang out with. I suppose none of this is remarkable, you may have a very similar kind of story about where you live. But for me, it is a kind of warmth and inclusion I never anticipated when I was a young man trying to imagine my middle-age years. 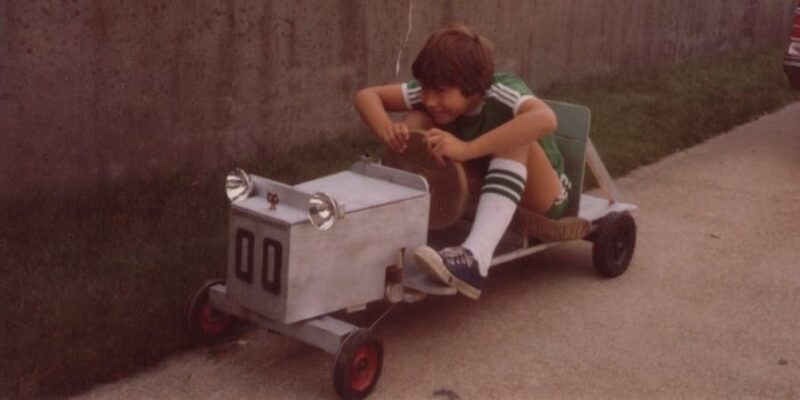 Growing up in fast-gentrifying Lincoln Park with my mom, or crime-ridden Hyde Park with my dad, neither I, nor my parents felt the kinds a connection to their communities we experience today. As strongly bound to the neighborhood I feel today, I wonder how tenuous it is in the long run. Will we feel this way once my son moves out for college? What about if my grocer retires? My dry cleaner? What if a new crop of rich idiots moves in? I feel like I’m in the middle of a good ride right now, and I don’t know how long it’ll last. Maybe a couple years, maybe forever. Let’s hope for the latter. Next PostNext How Do We Decide You’re Enough?